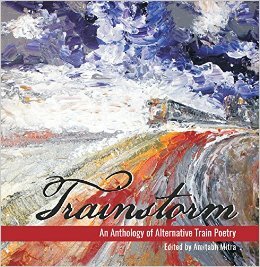 ‘Trainstorm-An Anthology of Alternative Train Poetry’ is called ‘alternative’ because it is about the journeys that we take through our minds and our lives, linked somehow with the train journeys. With 50 poets and 80 poems, this anthology titled ‘Trainstorm’, edited by Dr. Amitabh Mitra, chugs through our lives, bringing back memories of train travel, recent and past, forging a link between the poems and our own experiences. Alberto Russo’s poem ‘Choo-Choo Boy’ aptly connects the older man he is talking about to his childhood. Usha Kishore talks of a ‘platform of long ago/crowded with thoughts’ in her poem ‘Pettah’, in ‘Railgadi’ she is ‘Flying across time like an arrow,/ across plains and hills, across singing/rivers poured into the silk of memory. In ‘Train Ride’, R.K. Biswas’ poem, we come across how being ‘wedged between sweaty knees/rustling buttocks in synthetic saris’ on a train can lead to desperate measures. With diverse poets writing of their train journeys, through different lands, stopping at different places, at different points of their lives, this anthology also preserves a form of travel which is still popular but may soon disappear in the years that come. Horse carriages are things of the past and trains may follow. But till this happens, the joy of a train ride is an experience to remember. The poets in this anthology help us believe this. The anthology is brought to life with the black and white photographs taken by Dr. Amitabh Mitra of trains and platforms and railway tracks and the fleeting countryside. This coffee table book has a beautiful painting done by Dr. Amitabh Mitra as its cover of a train coming at us, riding through a storm.